In exceptional homes, spas, and other places, real marble bathrooms tiles project the highest level of luxury and style. The natural colors and patterns blended nicely with beautiful accessories and other décor options to create a genuinely opulent setting. Real marble is a natural metamorphic stone formed when limestone is subjected to centuries of intense pressure. Depending on the variable conditions of nature plus the material components which may consist of mineral calcite, clay, quartz, pyrite, micas, or graphites, the color and texture are variable. Each tile will be different from the next. As for durability, marble is forever. The great art sculptures of Michelangelo and others were created hundreds of years ago and are still exhibited without any deterioration. The Taj Mahal in India is a 500-year-old edifice made from white marble that still shines brilliantly. PetraSlate Tile & Stone of Denver offers an extensive menu of the most exceptional quality of natural marble tile available. Depending on the source, the colors and patterns will vary from white to gray to almost entirely black. Marble is quarried all over the world including the United States, Italy, Spain, Greece, Russia, China, Israel, and more. Marble from each country is influenced by their differing geologic influences and yield a wide variance in color and patterns. Tiles may vary in dimensions as well, ranging from 12” by 12” at between ½” to 5/8” thicknesses. Mosaic tiles as small as 1” by 1” are perfect for matching backsplashes and borders. 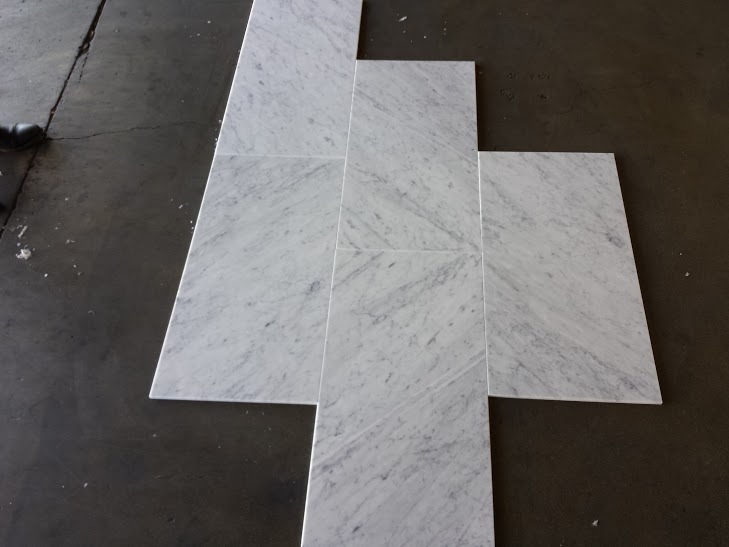 Installing natural marble tiles requires some pre planning to achieve the desired effect. Assuming all the tiles are from the same production, matching the patterns of adjacent tiles requires laying out all individual tiles beforehand to create the best possible arrangement is advised. Marble, compared to other natural stone, is slightly softer yet just as durable. The “softness” of the stone, along with its natural beauty, is what makes this material easier to sculpt and shape. PetraSlate Tile & Stone is a leader in natural stone tiles and veneers for construction and remodeling companies. For more information, check out the broad array of high-quality tile and stone products on PetraSlate’s website. For questions and information, phone the professionals PetraSlate at (303)-280-9595.